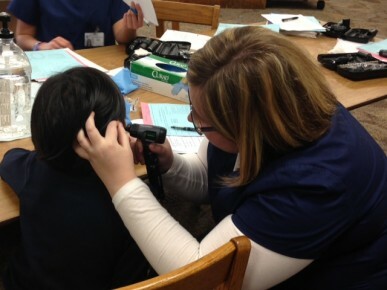 The big kids (Physician Assistant students from Butler) needed experience dealing with young patients. The little kids (kindergarten and first-grade students at the IPS/Butler Lab School) needed to have their eyes, ears, and teeth checked. 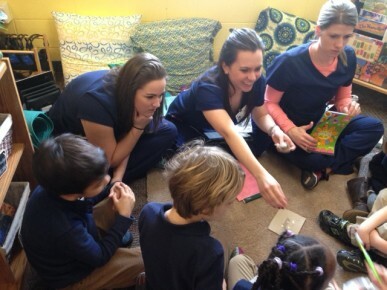 And so, on February 23, 74 PA students and 5 PA program faculty visited the elementary school a few miles south of Butler to administer exams and teach them about good dental hygiene while having a little fun, too. Before the exams, the PA students fanned out to classrooms to work with the Lab School students in small groups. In one classroom, Butler PA students Briana Henke of Sycamore, Illinois; Jordan Kirkegaard of Milwaukee, Wisconsin; and Abigail Gallett of Phoenix, Arizona, sat on the floor with eight Lab Schoolers to coach them on how to take care of their teeth. They started with the basics—what causes cavities and which sugary foods to avoid—and moved on to showing them how much toothpaste to use and the proper way to brush and floss. A giant set of teeth, an oversized toothbrush, and a rope of floss made it fun and funny for the kids. Here’s my toothpaste, here’s my brush. Sing that about four times while brushing—taking roughly two minutes—and brush at least twice a day, the Butler students advised. This is the second year Butler PA students have gone to the Lab School to examine the youngest students. Last year, they noted a number of students with plaque buildup—and they also discovered a student who had vision problems. The child’s teacher said the student has been doing much better in school after being diagnosed and getting glasses. 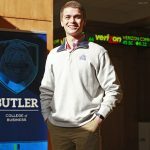 When he’s not making a name for himself playing basketball, Butler guard Jackson Aldridge is working on his career as a businessman/entrepreneur. As part of his Real Business Experience course, the sophomore economics major from Sydney, Australia, has created Stadium Sidekick, an inflatable drink holder that doubles as a seat cushion. “The long term goals of my business are to establish a reliable, comfortable, and unique product to both professional and collegiate sporting venues for fans to enjoy,” Aldridge said. Product development began in Butler’s Real Business Experience (RBE) class, where students team up and devise an idea to produce and market a product or service. Then they produce and sell the product. Aldridge and his team in the RBE class established a connection with a supplier in China to manufacture the product, and towards the end of the semester he made bulk sales totaling 200 units in just two weeks of sales. 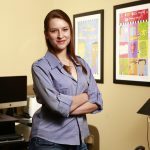 If the business concept is approved by an outside funding review board, students can take a second class where they actually run their business marketing their product, and the College of Business will loan the team up to $5,000 to get up and running. 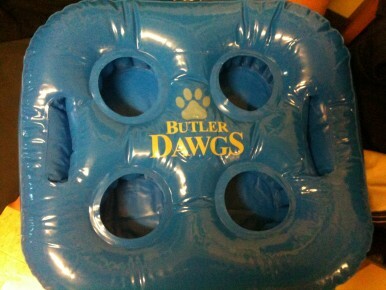 Aldridge is taking the second class and will be selling the Stadium Sidekick during the spring semester. After he pays back the money, he can keep the profits. 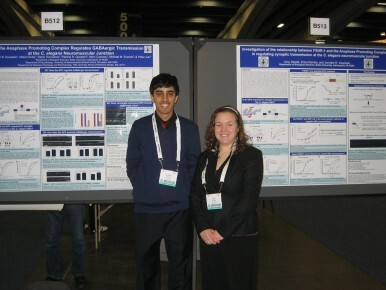 Butler senior Hitesh Dube won first place in an undergraduate poster session at the American Society for Cell Biology (ASCB) meeting in San Francisco. In besting a field of nearly 100 undergraduates, which included students from across the country and around the world, Dube won $500 and will have his picture in next month’s ASCB newsletter. Dube, along with labmate and senior biology major Amy Wasilk, attended the meeting in December with their research advisor, Assistant Professor of Biology Jennifer Kowalski. Both students presented posters on their research during the main conference session, in addition to competing in the undergraduate poster session. “Both Amy and Hitesh have worked in my lab for nearly 3½ years, and I am so proud of the work that both of these students have done,” Kowalski said. Dube’s poster showcased work he and Kowalski have been doing in collaboration with scientists from Tufts University and the University of Massachusetts. They are investigating the mechanisms by which an enzyme called the APC controls neuromuscular signaling in microscopic roundworms, known as C. elegans. Wasilk's poster described studies she and a former labmate have done to begin characterizing the role of one potential APC target protein in neurons, a receptor called FSHR-1. As the nervous system of C. elegans is similar to that of humans, the overall goal of Kowalsk and her students' investigations is to use the worms as a model to better understand general nervous system function. The goal of the work is to use the worms as a model to better understand general nervous system function. Dube’s contributions to the project involved developing and performing a number of experiments with these roundworms. In many of these experiments, he compared the nervous systems of normal worms to those of genetic mutants lacking the function of the APC enzyme to determine the specific cell types (motor neurons or muscle cells) where the APC acts to affect neuromuscular signaling.